BILL - The Romanian Government is today debating the public pensions system bill, endorsed by the Finance Ministry. The document is under public debate since August and has been modified following talks with the main stakeholders. The new law is aimed at increasing pensions and eliminating inequities in the system. Among other things, the bill stipulates that pensions will be paid only in keeping with each individual's contribution, and those whose seniority is the same, but retired in different moments in time, will get the same amount. The future law would be implemented in stages until 2021, benefiting more than 5 million Romanian pensioners. Some 150 pensioner representatives from across the country have protested today in front of the Government building, claiming an increase in the pension point up to 45% of the average gross salary as of 2021.  MOTION - The simple motion filed by the opposition National Liberal Party and Save Romania Union against the Economy Minister Danut Andrusca has been dismissed today by the Chamber of Deputies, following Monday's debates. The National Liberal Party claims that the minister's incompetence, proven by the evolution of the main economic indicators, is bringing Romania to bankruptcy. According to the Liberals, in nine months of office, Danut Andrusca has made no progress in solving the main problems of his ministry, carrying out an activity described as 'catastrophic'. Also on Monday, the Liberals filed a simple motion against the Culture Minister George Ivascu, whom they accuse of failing to properly manage the celebrations due on December 1st 2018, marking 100 years since the Great Union. INFLATION - According to the National Statistics Institute, in Romania, the annual inflation rate reported in September dropped to 5.03% from 5.1% in August, against the background of prices going up. This year, the highest rate was registered in May: 5.41%. This is the highest level since February 2013, when the increase in consumption prices was 5.65%. In early August, the Romanian Central Bank revised downwards to 3.5% the inflation forecast for the end of this year. We recall that in August Romania registered an annual inflation rate of 4.7%, the highest in the whole of the EU, for the seventh consecutive month. DEBATE - On October 23rd in Strasbourg, Romania's president Klaus Iohannis will take part in a debate on the future of Europe, hosted by the European Parliament. The Romanian president's intervention is one in a string of events of this type organized between heads of state and government and MEPs, concerning the future of the European Union. Among those who have participated in the debates are the Irish Prime Minister Leo Varadkar on January 17th, the Croat and Portuguese premiers Andrej Plenkovic and Antonio Costa on February 6th and March 14th respectively, and the French president Emmanuel Macron on April 17th. ASSASSINATION - A new suspect has been arrested near the city of Hamburg in relation to the killing of the Bulgarian journalist Viktoria Marinova. The suspect, described as a young Bulgarian aged 20-30, was detained in Germany, where he is living with his mother, after leaving Bulgaria on Sunday. According to the Bulgarian media, the DNA found at the crime scene is identical to that of the young man. Previously, the police had detained an ethnic Ukrainian from the Republic of Moldova, who also has Romanian citizenship, but released him for lack of evidence. The dead body of the Bulgarian journalist, aged 30, was found on Saturday in a park on the bank of the River Danube, in Ruse. She had been raped and then killed. On her last show on September 30th on a TV station in Ruse, Viktoria Marinova had held a talk with two journalists, Dimitar Stoianov from Bulgaria and Atiila Biro from Romania, who are conducting an investigation into cases of fraud with EU money, involving business people and officials. Investigators are trying to find the motive for the assassination, without excluding a connection with the journalist's professional activity. SPORT - Romanian athletes have won another three medals - one gold, one silver and one bronze - at the Youth Olympic Games in Buenos Aires. The gold medal was won by the female weightlifter Sabina Baltag, in the 53 kg category, with a total of 177 kg. Florin Arteni - Fintinariu and Alexandru Laurentiu won silver in the male canoe double. Tabita Maftei and Alina Maria Beletchi won bronze in the two women's canoe event. In the rankings by medals, Romania ranks 5th, on a par with Colombia, each with 2 gold medals, 2 silver medals and 2 bronze. Romania's youth team is made up of 34 athletes, 21 women and 13 men, competing in 14 events.